Following a step-by-step methodology, you will acquire the essential skills and vocabulary which are necessary to connect your ears to the fingerboard, develop ideas, interact with other musicians on a deeper level, and expand the traditional role of the bassist. With these live video bass lessons, you will expand your fretboard familiarity and knowledge of chord/scale theory, improve your sight reading and ear training, and also increase your technical proficiency on the instrument. You will be presented with the fundamental tools that are required to improvise great bass lines and solos on any chord type, chord progression, or song form in any style of music. These lessons are structured for bassists of all levels from beginner to advanced who are passionate about becoming a more proficient bass player and are seeking an indispensable resource for the contemporary study and analysis of techniques, theory, improvisation, and principles on bass guitar. Why waste transit time and money while traveling to and from private lessons when you can study one-on-one with a live instructor directly from the comfort of your own home? Many people who have purchased any of the bass books or bass courses enroll in live video bass lessons to help compliment and reinforce the concepts introduced in those methods. You do not need an elaborate setup in order to do live video bass lessons, and most people already possess the basic equipment for these lessons without needing to purchase additional gear. In addition to a bass and an amplifier, you will need either a desktop/laptop PC, Mac computer or phone, a broadband internet connection, computer speakers or headphones, Skype, and a webcam. Any computer or phone that has been acquired within the past few years that is capable of capturing video/audio will most likely work well for live video lessons. If you can watch videos on any of the online video sharing sites such as YouTube without buffering or dropping frames, your device should have no problems streaming live video lessons. All lesson materials including standard notation, tablature, play-alongs, audio tracks, and video clips will be provided. Thanks for your interest in my live video bass lessons! 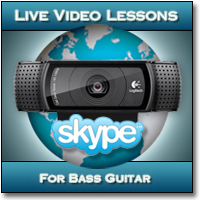 Please take a couple minutes to fill out and submit the form below to enroll in live video bass lessons. The information that you provide in this short form helps me gain a better understanding of your current playing ability, and it also assists in assembling a program that is specifically designed to meet your needs and achieve your goals. What Goals Would You Like To Accomplish With My Lessons? How Did You Learn About My Live Video Lessons? Thanks so much for filling out and submitting my enrollment form! I will contact you via e-mail within 24 hours of receiving the information you submitted to confirm your enrollment. After you have filled out and submitted the enrollment form, you can purchase lessons using the drop-down menu below. Simply choose the lesson format you prefer and click "Enroll Today!" Once you click on the "Enroll Today!" graphic below, you will be taken to PayPal where you can complete the enrollment process by purchasing lessons. PayPal will send me a notification of payment received via e-mail as soon as you buy lessons which will also specify the lesson format you purchased (4 weekly lessons, 2 bi-weekly lessons, 1 lesson per month, or 1 bass clinic). PayPal is the preferred method of payment, especially if you are located outside the United States because then we will not have to deal with foreign currencies and exchange rates. You do not need to open a PayPal account in order to pay for lessons. On PayPal's website, you will have the option to use a debit or credit card without being required to setup a new account. I also gladly accept checks and money orders. If you would prefer to purchase lessons with a check or money order, please send your payment to the mailing address listed on the CONTACT page. If you would prefer to not use PayPal or send money in the form of a check or money order through the standard mail, you can also utilize Western Union or MoneyGram. Please feel free to use whichever payment method works most conveniently for you. If you have any questions, please let me know. Thanks again for your interest in my lessons. I look forward to working with you and beginning lessons soon! Lessons can be scheduled any time between the hours of 10:00 AM and 10:00 PM Central United States time, 7 days a week. Within 24 hours of receiving your enrollment, I will contact you via e-mail to schedule our first lesson.